Where Is Animal Rights in Korea Heading? In the media nowadays, it is easy to stumble upon news related to animal rights. The issues related to people infringing upon animal rights range from the recent news with the representative of Coexistence of Animal Rights on Earth (CARE) being found guilty of having euthanized hundreds of rescued animals, to the ongoing debate about the consumption of animals in our diet, as well as the abuse of animals for our pleasure. 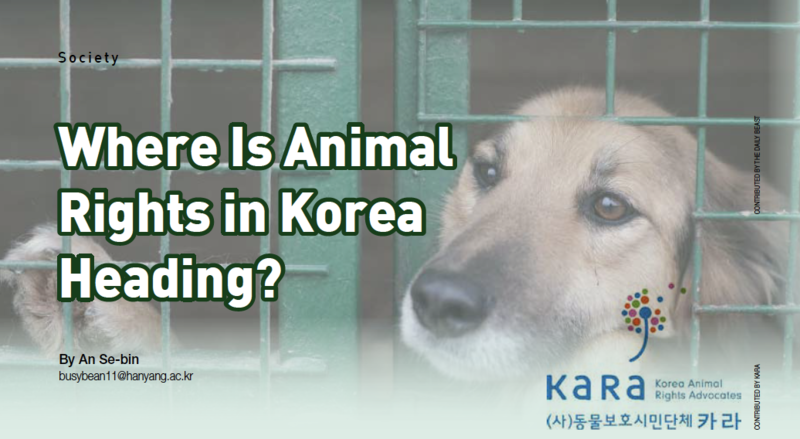 Although there are laws written in the Korean constitution regarding animal rights, enforcement is difficult due to the ambiguity within the laws. Animal rights stand for the belief that animals also possess the right to life; the right to avoid suffering and to not be abused. In Korea, the Animal Protection Law exists as mentioned before, but it is not stated clearly or in enough detail. With the incident involving CARE, other past issues regarding animal rights infringements were also brought up to the surface. Yim also pointed out that, “All pet companies must clarify their responsibilities through a strict process of registering their company. In addition, ‘Petiquette’ (a shortened term for Pet + Etiquette) should be taught to everyone hoping to be a future pet owner.” In Korea, many animals are easily abandoned by their owners because the process in which these animals are bought can happen too quickly and easily. If the process gets more complicated, then those who previously bought the animals without much thought will be forced into deeper consideration before they purchase a pet. There are ongoing discussions about the extent to which people should protect animals’ rights. For example, does it also refer to not killing animals for humans to consume meat? “The prohibition of dog meat being used as food and the total ban on the consumption of other animals, such as pigs and cows for food are the ultimate goals of some in the animal rights movement, but I do not think it is realistically possible. It would be more practical to reduce the frequency of eating them, and to use certified animal welfare approved livestock products,” said the representative of KARA. Currently, the constitution of Korea states that animals are a subject of possession. Comparably, Germany, states that animals should be protected. Song asserts that “Setting Germany as an example, Korea should also describe the animals’ dignity of life and not treat them as objects in the constitution. Also, with regards to animal abuse, there are a lot of ambiguous laws in Korea. This lets people reinterpret the laws in a way that they want.” Making the ambiguous laws clearer and more detailed can help the animals. For example, by clearly stating in which situations the animals can be subjected to what some consider to be abusive treatment, and by specifying times when it is acceptable to use certain medical instruments. How Should the Law Be Improved? What Kind of a Stance Should the People Take? In order for these laws to be made and changed, there needs to be active participation from the people by signing a petition or joining a protest. Song said, “For policy lobbying to happen, we need at least 200,000 people. Out of the 10,000,000 people in Korea who own pets, only around 30,000 people are regularly participating.” Even though the number of people interested in animal rights issues has grown, Korea still lacks active participation.